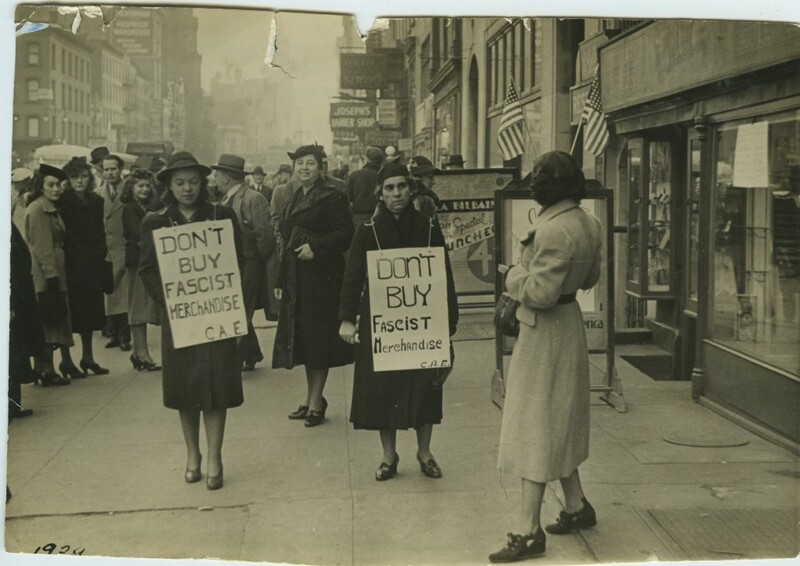 Spanish women picketing Casa Moneo, the Spanish grocery store on West 14th Street, in the heart of Little Spain. Courtesy of the Cividanes family of New York. ALBA has moved offices from one historical location to another one. Our new home is steeped in history and ripe with promise. The building that would become the true focal point of Little Spain in the 1920s and 30s is the handsome brownstone that still stands, and that still flies a Spanish flag, at 239 West 14th Street. By the early 1930s, the area around the west end of Manhattan’s 14th Street had already become known as “Little Spain.” As the main commercial artery of this part of the city—where Greenwich Village, Chelsea and the Meatpacking District all converge around the Hudson River piers—“La Catorce” was chosen as the site of the first Catholic Church established in New York expressly to minister to the growing population of immigrants from Spain. Nuestra Señora de Guadalupe was founded in 1902, between Seventh and Eighth Avenues, on the north side of the street. In the following decades, that very block, on both sides of this broad two-way cross-street, would become home to a remarkable number of businesses and organizations catering primarily to Spaniards. By 1914, for example, just a few doors east of the church, Casa María would be founded; a Spanish settlement house that promoted “the temporal, social, mental, moral and religious welfare of young women, particularly for those dependent upon their own exertions for support.” And because Spaniards have bodies as well as souls, by the mid-1920s a brownstone storefront just across the street from the church and settlement house would become a bustling Spanish grocery and general store. In 1929, that store would be renamed Casa Moneo, a place destined to become a legendary institution: the main purveyor, for decades, of chorizo, saffron and all things Spanish to New Yorkers from the neighborhood and far beyond. But the building that would become the true focal point of Little Spain in the 1920s and 30s is the handsome brownstone that still stands, and that still flies a Spanish flag, at 239 West 14th Street. This row house was acquired in 1925 by a remarkable Puerto-Rican born Catalonian, José Camprubí, who at the time was the owner-editor of New York’s only Spanish-language daily newspaper, La Prensa, and President of the Unión Benéfica Española [UBE]. North sidewalk of West 14th Street, between 7th and 8th Avenues, c. 1929. New York Public Library Digital Photos. The UBE was a mutual aid society that had come into its own during the World War I years, when Spanish immigration to the US reached its historic peak. The building has served as the clubhouse/headquarters of the UBE and the other Spanish organizations that eventually merged with it, including La Nacional (founded in 1868). Today, in the midst of the 150th anniversary of the founding of La Nacional, the descendants of those immigrants of more than a century ago are combining forces with the recent wave of Spanish professionals who, like their precursors, have come to New York in search of opportunities. And together they are breathing new life into the club and its landmark building, by renovating the club’s restaurant, developing vibrant cultural programs, and attracting tenants and partners who share the club’s sense of history and its connections to Spain. During the mid-1930s, as storm clouds gathered over Spain and the rest of Europe, West 14th Street was already a bustling enclave of Spanish immigrants. 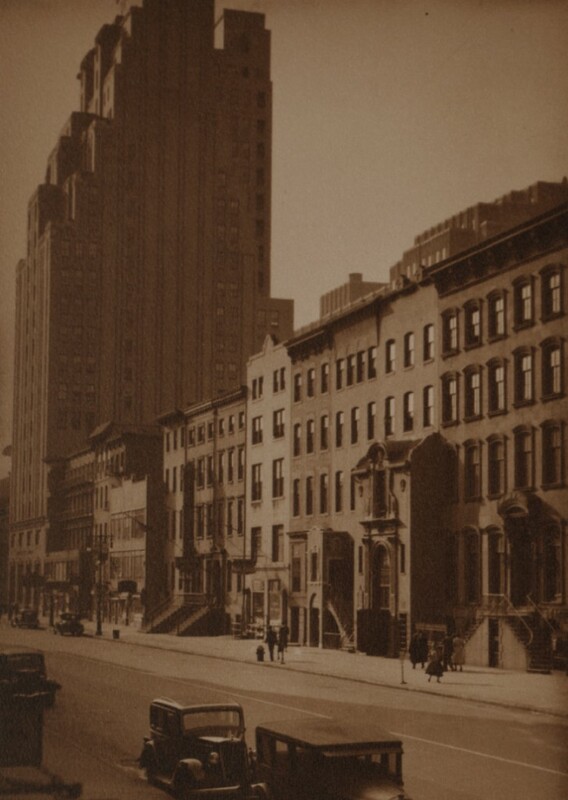 The building at number 239 was a de facto community center for the neighborhood, with a restaurant on the ground floor, ballroom on the second, and meeting rooms as well as rented offices and apartments on the third and fourth floors. New York’s Spanish colony was predominantly a working class community. Like Spanish immigrant enclaves all over the US at the time, its members had, for the most part, high hopes for the Second Republic. In fact, many Spaniards returned to their country during the early years of the precarious democratic regime inaugurated in 1931. Many others were toying with the idea of returning, when, in July of 1936 the Civil War exploded. Telling Facts Concerning Communism, Vol 1, No. 3, Jan-Feb, 1939. 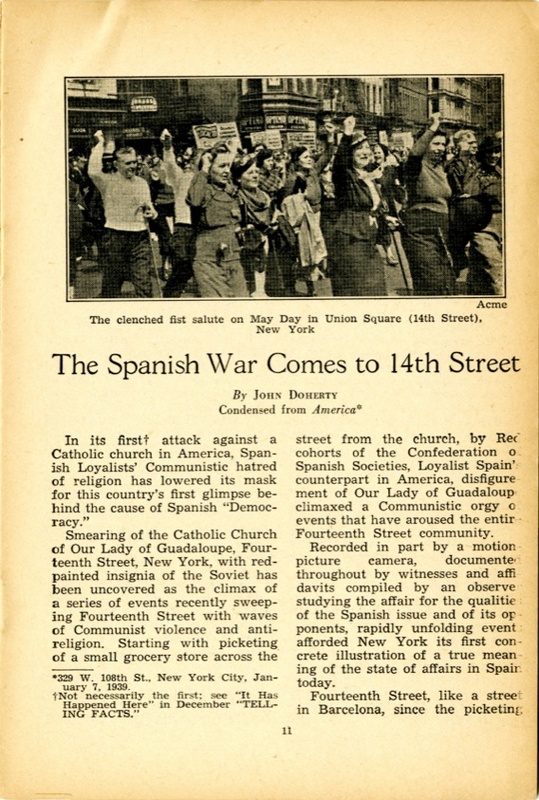 “The Spanish War Comes to 14th Street,” screeched the headline of the red-baiting publication “Telling Facts Concerning Communism” in its January-February 1939 issue. The article, biased and lopsided as it was, did point to an underlying reality: though predominantly pro-Republican, the Spanish colony was ideologically split. Carmen Barañano, for example, the owner of Casa Moneo was a woman of strong Catholic beliefs and a generous benefactor of Our Lady of Guadalupe church just across the street from her store. She was also staunchly pro-Franco—although many—probably most—of her neighbors and customers were hard-core Republicans. And so it was, that the war in Spain would usher in a long period of solidarity and strife in both Spains, Big and Little. Still, throughout the war and the post-war years, 239 West 14th Street would remain a beacon of anti-fascist and anti-Francoist mobilization and activism. And, as of 2018, a most auspicious address for the new offices of the Abraham Lincoln Brigade Archives. James D. Fernández, professor of Spanish at NYU, serves on ALBA’s Executive Committee.